Saskatchewan Farmers Win Major Prize! conference and then brought him to Victoria to speak in 2004. The Jury of the RLA honoured the Schmeisers “for their courage in defending biodiversity and farmers’ rights, and challenging the environmental and moral perversity of current interpretations of patent laws”. The Schmeisers spoke at a well-attended public meeting in Victoria in July, 2008, encouraging all Canadians to resist the corporate control of our food. In 2009 these committed and tireless farmers continue to speak out against the corporate control of our food security and plant life. Percy Schmeiser calls upon people around the world to make the struggle for the control of life from seeds to food into a political struggle. After going to the Supreme Court of Canada after Monsanto’s GM Canola was found on his property – Monsanto trespasses on farmers’ land regularly everywhere to remove samples of their crops – even though the court admitted it could have easily come by accident, which it had – Monsanto still has the legal right to claim that farmers violate their patent on a life form if it finds GM plants on farms. 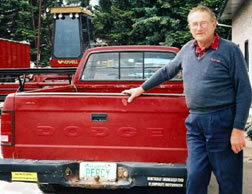 Percy says he has taken the fight as far as he could in the courts; he says it is now a citizen responsibility for all of us everywhere to demand and work for political change that will protect farmers’ rights, consumers’ rights and an end to genetically modified contamination of food stocks. Percy travels all over the world speaking to governments, farmers and social movements telling his story and explaining the dangers of corporate control of our food. 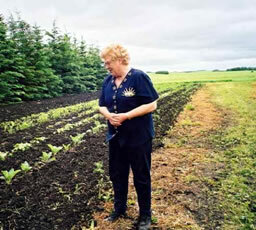 In 2005 Louise Schmeiser found GM Canola in her organic garden. She filed papers with a small claims court in Humboldt, Sask., seeking $140 in damages from Monsanto, the cost to remove the plants from her organic garden, after sending several registered letters to Monsanto to come and remove them as the company promises to it advertisements. She had no response from Monsanto so she hired some students to remove and destroy the plants and made a claim against it last October. Monsanto brought its city lawyers to court and got a postponement. The case was heard in March, 2005. In June, the judge dismissed the case, stating (verbal information only, weeks after her decision, Louise Schmeiser had nothing in writing and had learned the result from a reporter) that the Government of Canada allows Monsanto to spread its GM seeds anywhere. She will not give up. Louise says nobody has the right to control life.